BRYAN EATON/Staff photo. 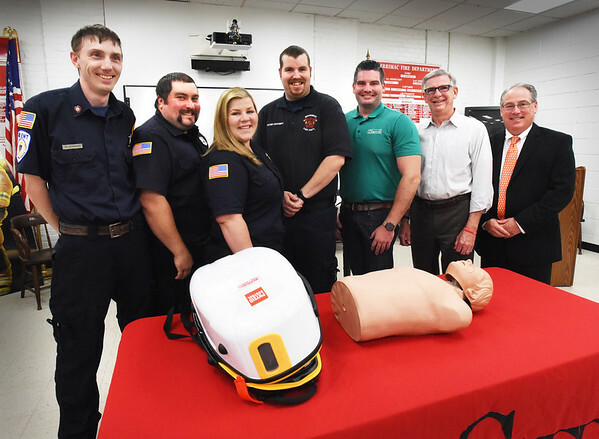 The Merrimac Fire Department has purchased a Lucas 3 chest compression system, at left of mannequin, with donations from the community and major donors. From left, firefighters who were on the fundraising committee, Will Howard, Brandon Cox, Nicole Richard and Shane Sevigny with Eric and Rick Fournier of 1st Payroll and Haverhill Bank president and CEO Thomas L. Mortimer. Missing from photo are representatives of Salter Bus Company.